If you have an empty space…we have a tray for that! With the holiday season being over, it is no secret that we all tend to feel like our houses are a little more empty with the Christmas decor coming down. It is nice to refill some of those spaces with pieces that feel fresh and new. There is no better place to start than with a tray! They are so easy to decorate. They do not take a lot to make them look complete. Try to incorporate at least 3-5 items and you are good to go. Odd numbers are a great rule of thumb when it comes to decorating! 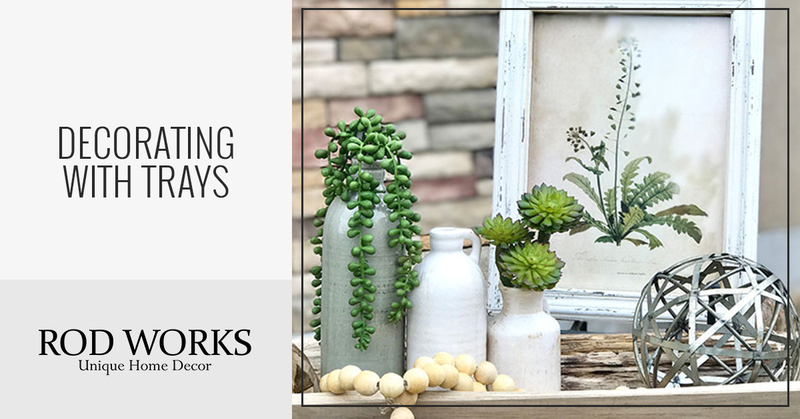 They look great from all angles, which makes them the perfect centerpiece for a dining room table, coffee table, entryway table….Let’s be honest, every table really! They are the perfect addition to any room in your home. They are great on kitchen counters & islands, bathroom counters & toilets, living rooms & dining areas. They are easy to move around. No matter where your tray may be placed, you always have the option to quickly move it around if needed. If you are anything like us, convenience is everything! A 2018 trend we are seeing with decorating trays, is the use of all sizes of glass & ceramic votives. It is a really simple and clean look, but is extremely appealing to the eye! Try to find different colors, textures, metals & woods to add a fun twist to your style of decorating. Adding a touch of greenery to them is also a must! We do a tray giveaway at the first of EVERY MONTH on Facebook. Be sure to head over to our page to enter!